A big thank you to all who came down and chatted with us during the BuildTech Asia Building and Construction Technology Expo last week! 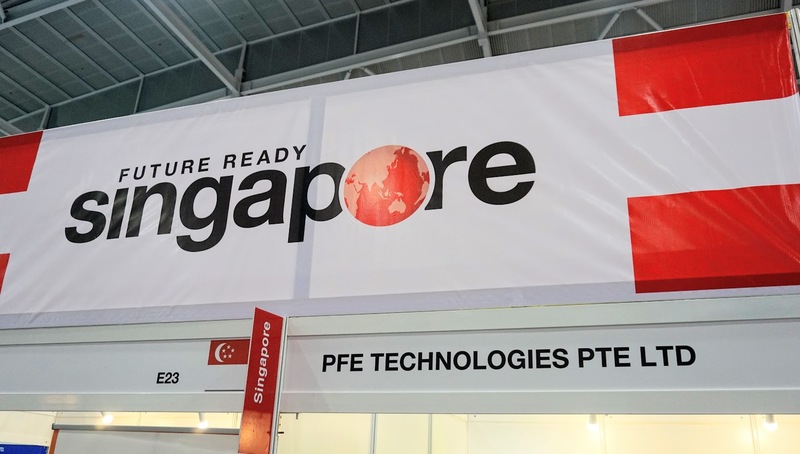 As part of the Singapore Pavilion, PFE Technologies Pte Ltd had a booth under the banner “Future Ready Singapore”. 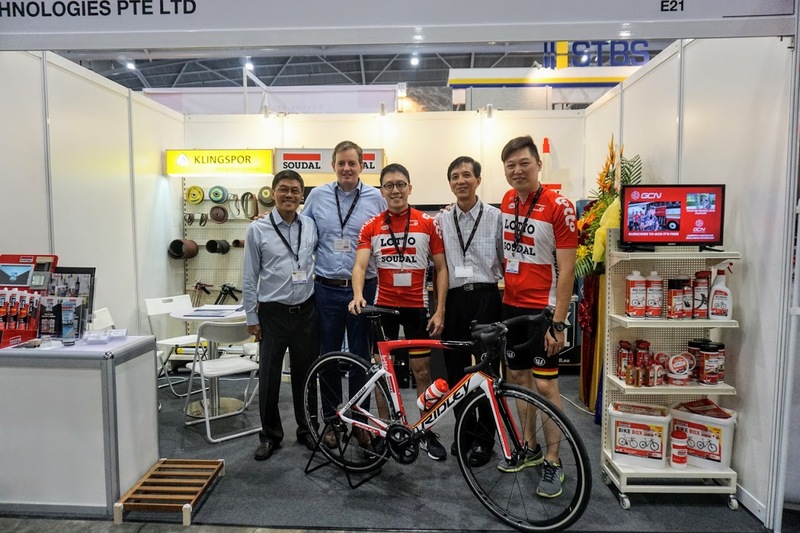 Just three words to encapsulate what it means to be part of the construction industry in Singapore – keeping the country in the forefront of construction technologies. Construction technologies come in all shapes and sizes, and we’re proud that our technologies come packaged in small(er) sizes – sealants and adhesives are an integral part of any construction, and using the right material in the right way is key to quality, whether in terms of durability, aesthetics, or efficiency. With our commitment to advanced construction technology, a better environment, and state-of-the-art production processes, PFE Technologies Pte Ltd is proud of our initiative to support greener, more efficient building practices. Our Pereseal 702 Acrylic Sealant product is now available in sausage packaging, besides the PE cartridge packaging that is currently available. Pereseal 702 will be available in both versions. Aluminium foil packaging offers many advantages, mainly lower costs, easier disposal, and better environmental-friendliness. Recent events have gotten the construction industry concerned about fire safety and standards. 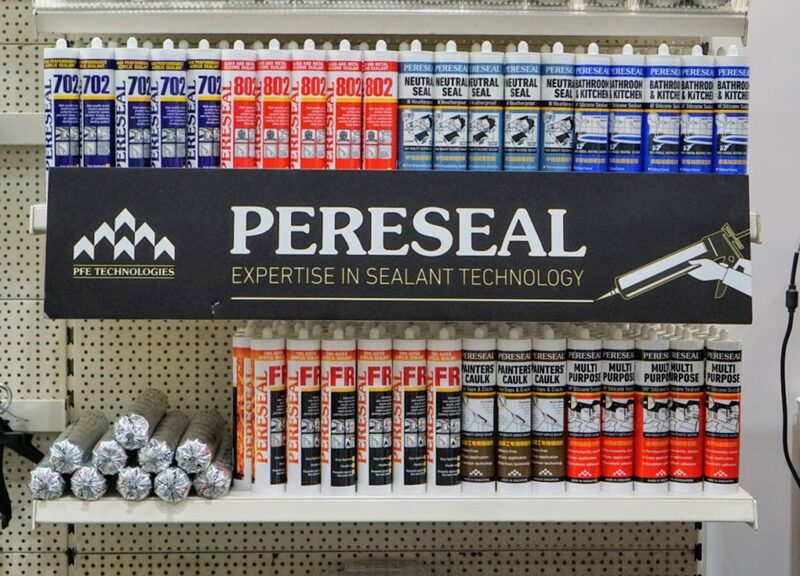 We are proud to have offered our fire-rated sealant, Pereseal FR, for over nine years – with our products being audited annually and consistently obtaining a Certificate of Conformity from TÜV SÜD PSB year by year. Pereseal FR is a fire-stopping acrylic sealant with a fire-rating for up to 4 hours according to BS 476: Part 20, with Warres Test Report number 181672. 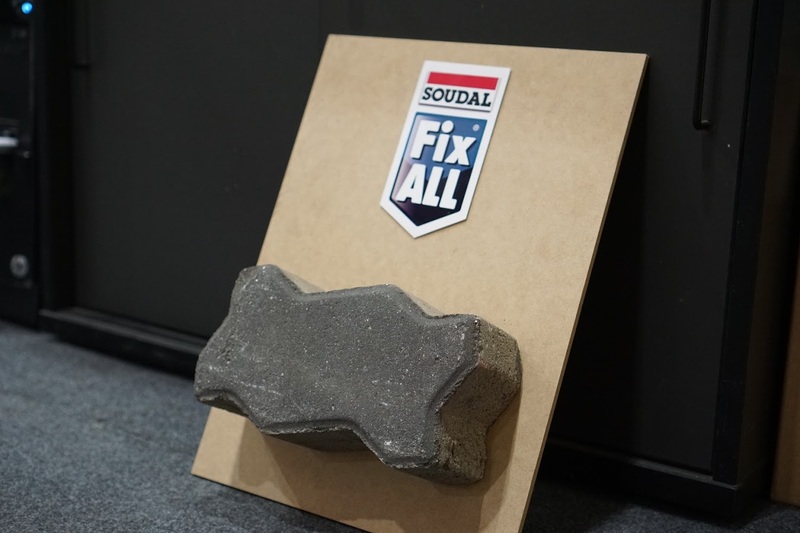 Soudal Fix All adhesives and sealants are the problem-solvers of the construction industry, offering solutions where other sealants and adhesives keep failing. Based on Soudal’s proprietary SMX hybrid polymer technology, the Fix All range offers unparalleled performance for all bonding and sealing applications. Advantages include extremely high bonding strength of up to 320 kg / 10 cm², extreme initial tack of up to 400 kg / m², ultra-high bonding speeds as quick as 20 minutes, suitability on almost all materials, extreme weather and water resistance, and food safe and anti-fungal sanitary properties. Visitors were impressed with the bonding strength with this simple example of a very heavy brick bonded to an MDF board using Fix All High Tack. 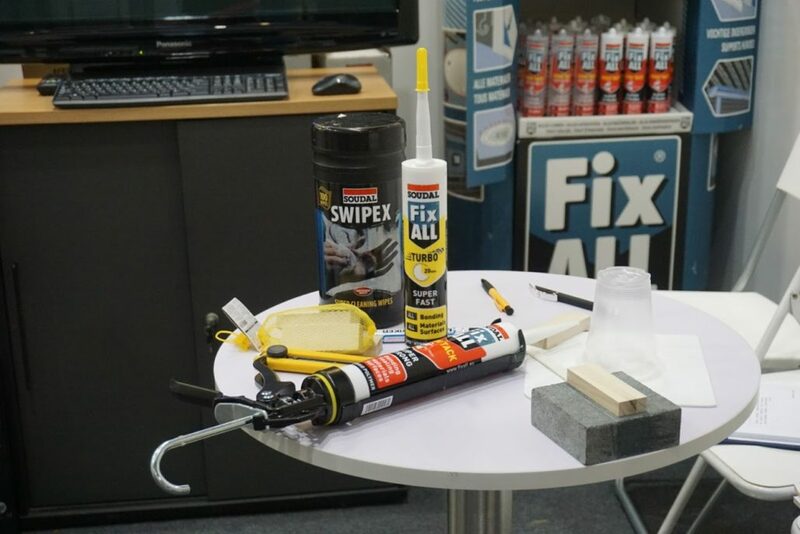 Our team also did live demonstrations of Fix All applications, including the Fix All Turbo 20 minute test where if anyone could break the bond after 20 minutes, they would win a prize! Unfortunately for the visitors, nobody won. Soudal PU foams are one-component, easy-to-use products that expand in size to easily fill up gaps, joints, and voids. They are high-yield and self-expanding, with each 750 ml can achieving up to 60 litres of cured foam. Based on Soudal’s open-cell PU foam technology, Soudal PU foams offer excellent thermal and acoustic insulation for many construction applications, reducing electrical consumption for cooling and HVAC. If you’re keen of eye, you’ll also notice the Ridley bicycle on display. No, we didn’t all cycle to the fair (though some of us did). 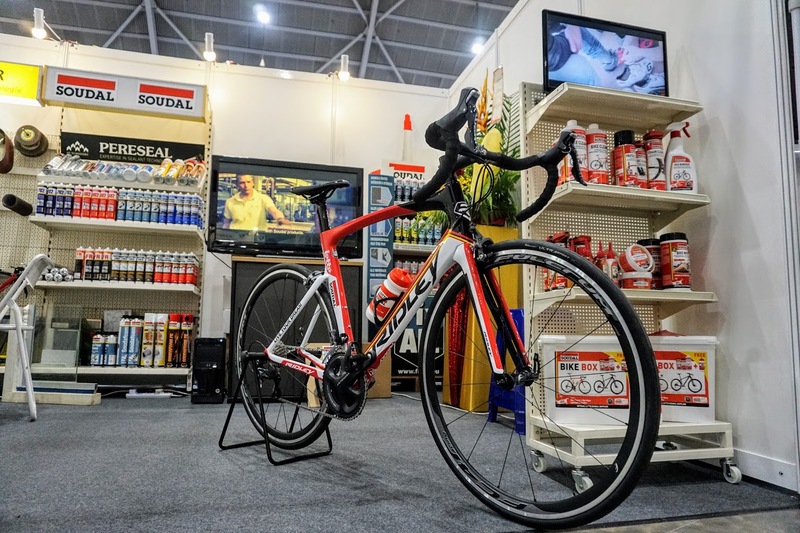 Soudal, being the sponsor of the Belgian Lotto Soudal cycling team, brought this Ridley Noah SL to showcase Soudal’s focus on matters beyond chemicals – in this case, cycling. Cycling has the reputation of being one of the most green and efficient ways that humans can travel, and in this spirit, Soudal has become a sponsor for their Belgian team, and for the Belgian Cycling Project. 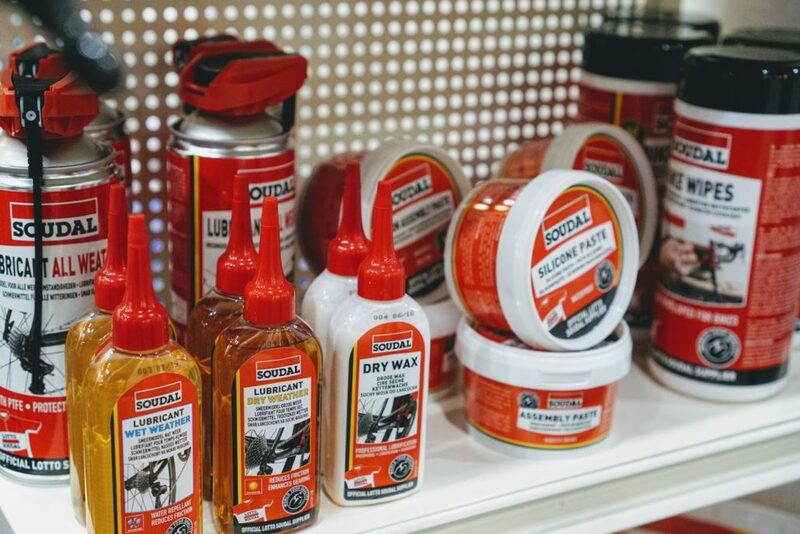 Also on display were Soudal’s Bike Range – chemicals for assembling, cleaning, and lubrication of bicycles, developed specially by Soudal for the team. Also, some of our team-mates in the Lotto Soudal jersey. 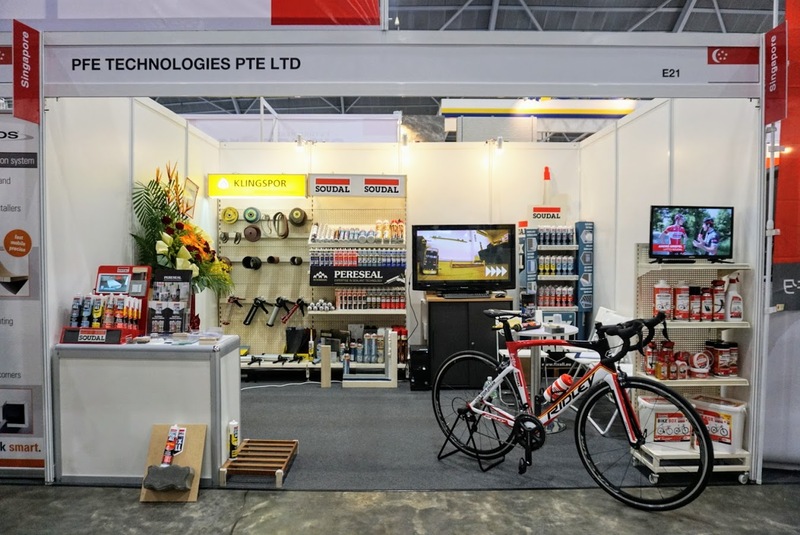 One big question we kept getting from visitors were – where can I buy these bike products? Our answer – stay tuned. All in all, we had a great time at the expo, and lots of fun with old friends and new with our favourite cold beverage (thank you Dester!). A big thank you to everyone who came down to the fair and met up with us, and we hope to see all of you soon.